What makes a good examiner? Is a mock viva essential? Is there a “standard” viva format? How can I avoid nerves? Twenty-seven chapters, twenty-seven questions, all answered. I thought you’d never ask! The Viva: Who? What? How? is £4.99 and is available from the Amazon Kindle Store and from Payhip. Payhip allows you to purchase .mobi and .epub versions of The Viva: Who? What? How and you can buy that wherever you are in the world. In all cases the ebook file is DRM free, so you can read it however you want. Nope! I published a book on viva preparation in 2013 called Fail Your Viva – Twelve Steps To Failing Your PhD (And Fifty-Eight Tips For Passing). In the Kindle Store it was a number one bestseller in two different education charts (Study Skills and College & University Education). It costs £3.49 and is available from the Amazon Kindle Store and from Payhip, just like The Viva: Who? What? How?. In the UK, Fail Your Viva is in the Kindle Store here. In the UK and around the world, Fail Your Viva is available from Payhip here. Can I buy both books at once? Of course! You can buy them separately, but from Payhip you can also buy the Viva Book Bundle – getting .mobi and .epub editions of The Viva: Who? What? How? and Fail Your Viva for only £6.99, wherever you are in the world. This is an offer I can only make through Payhip, it’s not available anywhere else. Click here to get it! Thank you for reading this post – I hope that you’ll buy my new book, The Viva: Who? What? 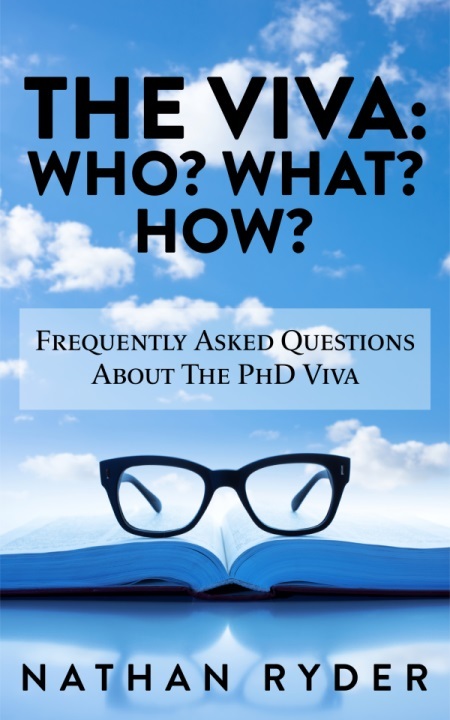 How?, a book about the frequently asked questions PhD candidates have about the PhD viva. It has a lot of questions, but also a lot of answers. Please share this post, share the links to the options for buying the book with people who you think will be interested – and of course, if it is interesting to you, I hope you buy it and like it. If you do, please consider leaving a review on the Amazon page, blogging about it or tweeting. Thank you for letting me share this with you!